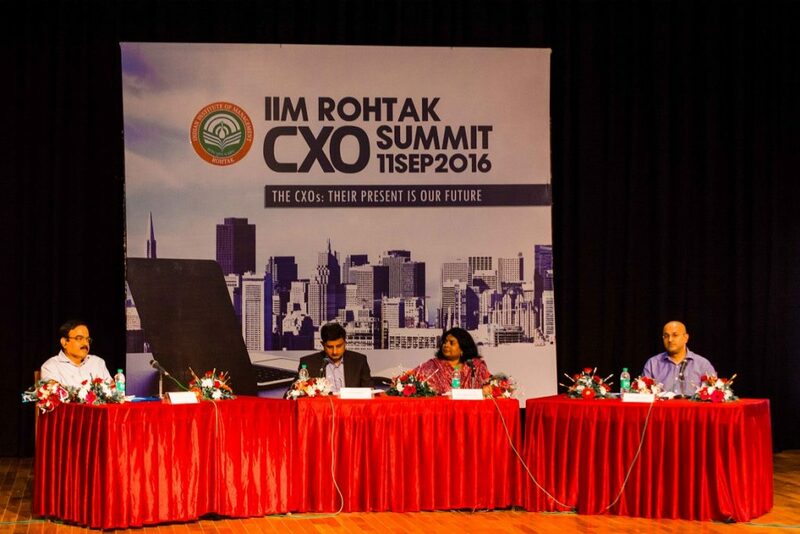 IIM Rohtak organized CXO Summit on Sunday, September 11, 2016 with the theme,” CXOs – Their present is our future”. In these times of ever evolving industries as well as their workforces, it is imperative to think out of the box. The summit sparked a discourse on how organisations can turn headwinds into tailwinds to deep dive into the future. Dr. Atanu Rakshit, Director of IIM Rohtak, acknowledged the emergence of digital information and the need to integrate it in organisational decision making process. Dr. Dinesh Dua, CEO, Nectar Life Sciences and Chairman, CII Chandigarh, was the keynote speaker of the event. Citing examples of notable start-ups like Instagram, Flipkart and OYO Rooms, he highlighted the role of innovative edge and positive disruption in organisational growth. He encouraged the academic world and industry to collaborate and create a transformative synergy by merging young tech savvy culture and old wisdom. Talking about the prominence of value over valuation, Smitha Nair Jain, COO, Barclays, analysed the current talent pool. She focused on the need to understand the macro environment of the work they perform. According to Murali Rajagopalan, CEO, Johnson Controls, who was also the moderator of the discussion, and Rajeev Aseeja, CEO, Aforereserve, talent is a combination of multiple factors and one of the major aspects is the capability to adapt to dynamic needs of the industries. The eminent stalwarts including Rajesh Kurup, MD, Milward Brown, Dr. Dhirendra Gautam, CEO, Indiba Consultancy, discussed about the exponentially increasing importance of information in the new age organizations. As observed by S Kannan, CEO, Muthoot Fincorp and Umesh Revankar, CEO, Shriram Group, everyone from the top management to employees should focus on leveraging information to achieve optimal solutions. Transcending the change by harnessing digital information and bridging the ever-widening gulf between the expectations of different generations of workforce will help separate the great organisations from the good ones. The summit was a step towards bringing this critical message home to the future managers and the academia straight from the top brass of the corporate world.